Franklin sophomore goalie Gianna Cameron made quite the impression during her rookie campaign as she helped solidify the Panthers defense on the way to another league title, a third Div. 1 East title in four years, and a spot in the state semifinal. Cameron, who was named to the HockomockSports.com First Team last spring, allowed only 5.9 goals per game and saved 58.2 percent of the shots that she faced to emerge as one of the league’s top goalies in her first season. With a loaded roster returning from last year’s team and several new faces ready to step right into the lineup, Cameron and the Panthers appear to once again be the team to beat in the Hockomock. Franklin junior Annie Walsh, the reigning HockomockSports.com Underclassman of the Year and an honorable mention for last year’s Player of the Year, will spearhead another loaded Panthers lineup in search of a sixth straight outright league title and seventh straight overall. Walsh scored a team-high 59 goals and added 13 assists as the focal point for the 22-2 Panthers, who went on to win a third Div. 1 East title in the last four years. Her play improved in the playoffs, as Walsh tallied 22 points in the postseason including 16 goals combined against Natick and Concord-Carlisle. A two-way player for the Panthers, Walsh also contributed 91 draw controls, scooped 53 ground balls, and caused 52 turnovers last season. "Franklin has emerged not only as the top program in the Hockomock League but in recent seasons as one of the top programs in the state. The Panthers have won the Div. 1 East title in three of the past four seasons, although they have yet to find a way past the state semifinal and get the opportunity to play for a state championship. 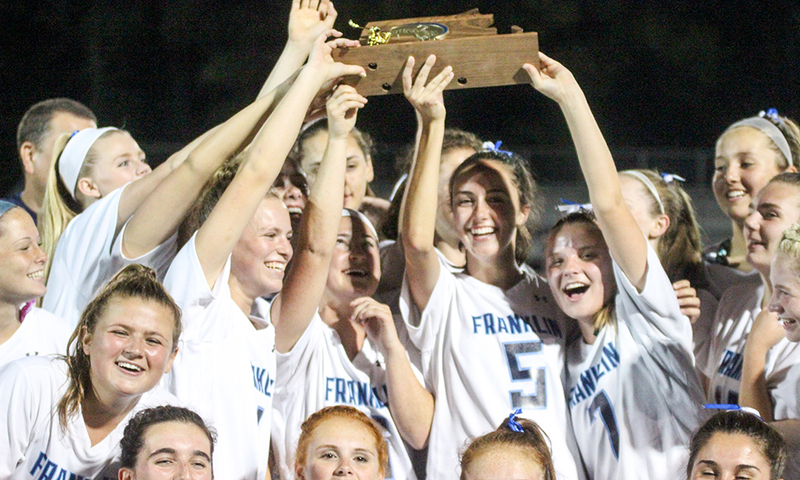 Despite being a team loaded with underclassmen again this spring, Franklin comes into the new season once again as the team to beat in the league and with state title aspirations. Reigning Underclassman of the Year Annie Walsh is back to spearhead the Franklin attack and create scoring opportunities for herself and for her teammates. One of the teammates that benefits is her sister Erin. The sophomore is a creative finisher around the crease and will be a top scoring threat again this year. Sophomore Gianna Cameron is back in goal for the Panthers after an impressive rookie campaign and senior Grace MacCallum is back to lead Franklin’s stingy defensive unit. Sophomore Kelsey MacCallum will be a player to watch in the midfield, while freshman Katie Jones is a newcomer that could make an instant contribution. "fixing the company’s problems will take years"
What is Franklin's most majestic tree?